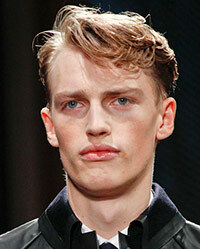 Victor Nylander was born in Roskilde, Denmark, in 1992, is a Danish male model. He was discovered after he sent his photos to modeling agency Scoop Models. He began his modeling career in 2010. He made his catwalk debut for Jil Sander show in Milan. Become the face of Dior Homme in 2011. Victor's hobbies are soccer and listening to music, Coldplay. Favorite football player is Cristiano Ronaldo. L'Officiel Hommes Netherlands, Essential Homme, Document Journal, GQ Italia, GQ Style Korea Covers, GQ China, SID Magazine, Muse, Vogue Japan, Numero Homme China, Dansk, HERO, V Magazine, Love Magazine, Vogue Hommes Japan, Mixte, CLIENT Cover, sleek magazine, Hunter. Dior Homme, J Brand, Roy Rogers, Forever 21, Zara, Ramsey, Massimo Dutti, Ports 1961, Hugo Boss, Michael Kors Holiday, Pull & Bear, Joe Fresh, Shiatzy Chen, Filippa K, Replay, Lacoste, Y-3, Trussardi, Nicole Farhi, Hugo Boss, Moschino, Abercrombie & Fitch. Walked runway for Daks, Philipp Plein, Dsquared2, Dunhill, Todd Snyder, Bottega Veneta, Kris Van Assche, Valentino, Belstaff, Louis Vuitton, Gucci, Siki Im, Salvatore Ferragamo, Duckie Brown, Richard Chai, Bottega Veneta, Neil Barrett, Ports 1961, Tommy Hilfiger, Miharayasuhiro, Dsquared2, Ermenegildo Zegna. Represented by agencies Ford Models Europe Paris, Wilhelmina New York, Scoop Models Copenhagen. Just bought a new pair of Converse in sky blue… love the color! I hear a lot of Coldplay from casting to casting. Love my family… and we are really close! My idea of fun is watching soccer, hanging out with friends.